The repository is here: https://github.com/mrdoob/three.js. The bower library is here: https://libraries.io/bower/threejs. The following module will add a floor to our scene in our ThreeJsBasics program. Note the call to the require method called define. The code passed to the define method will cause require to automatically load your floor.js file. It belongs in the constructor found in control.js. Insert it into your source just after you add the cube. At this stage you should be able to run the program and see a floor. The cube from the basics program should be partially buried in the floor, but still visibly rotating. You can place the above lines in a number of locations, but just below the calls to create the floor is a reasonable spot. You also need to compose an onKeyUp method that looks the one shown above, but has the opposite effect. In other words, the boolean values are set to tell the app that movement to the right, left, back or forward has stopped. The method looks very, very much like the one above, with one important difference which I'm sure you can guess. We will move in the x direction to mvoe left and right. Which direction, y or z, should we move to be able to move deeper into the scene? Just experiement a bit, and you will soon see which property to choose. Remember, we want to move left, right, forward and back. We don't move up and down. For now, try moving by plus or minus one unit. Note: Recalled that we declared both keyMOve and cameraPosition, so you know what those objects look like. When you are finished you should be able to "jump" right, left, forward and backward. You might experiment with moving smaller increments each time to make the jumps less jarring to the viewer. NOTE: When the scene is first rendered, the camera may be right in the middle of a cube. This means you will have to "backup" (down arrow) to move away from the cube and see it. If you are standing in the middle of cube, it might be invisible. We will fix all this later, but for now, we have to live with the scene in its half-finished state. Later you will see more complex code that allows us to move more smoothly through the screen, but this at least helps us get started moving around. When you first see the boxes in the scene, they will not have a brown wooden texture on them. Have patience, we will add them in this assignment, just not right away. Now from inside addCubes, you want to call addCube, but you will need to do something with the last parameters in order to make the cubes appear in different locations. In fact, you might want to call addCube more than once in your for loop. Perhaps you could hard code one of the last two parameters, and do sometihng with the other one that involved the loop variable i. If you look carefully you can see that there is a small space betwen each box. I'm doing this mostly so that you can clearly see when one box ends and the next starts. In a final version of our game, we might not want to include that space. But for now, its useful. To create the space, just add a small value to the z location of each box. You'll probably want to pick a value well under 1.0. Here is a create texture which we can use in class, but not in our final games. Or at least not until we get permission to use it. Just right click and download to your images folder. The results in your program are probably less than satisfying, as the boxes are hard to see. To fix that, we need to add lights to the scene. One event handler that I should mention is window resize. This event is triggered when the window is resized and it causes the scene to be recalculated so that it fits properly inside the window. As you can see, there is essentially nothing at all happening in index.jade. 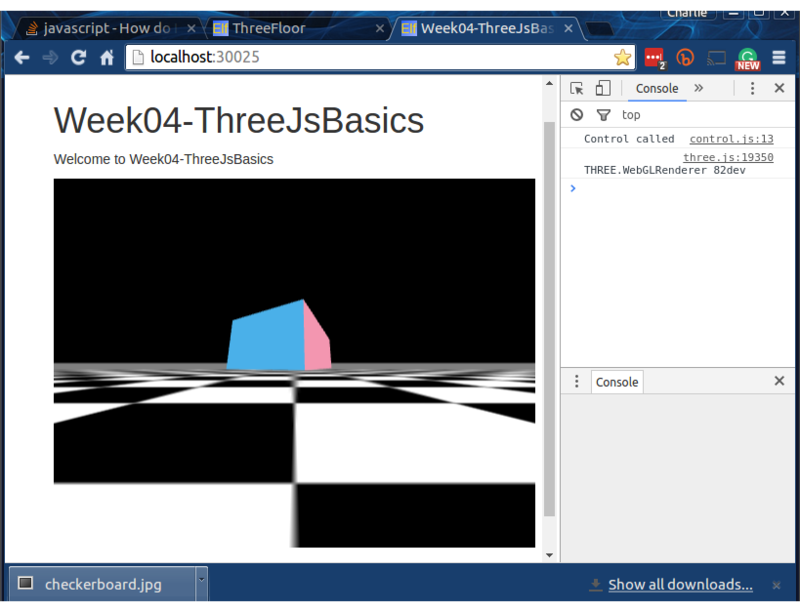 Our HTML body is occupied entirely by Three.Js. Later on we will see how to use CSS to lay HTML over the 3D scene. Click the Send Invitation button and share your BitBucket repository with me. I'm ccalvert on BitBucket.